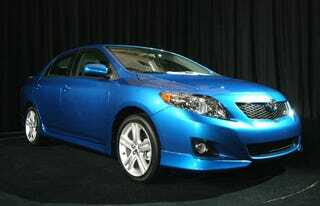 From the bolt up a TRD supercharger department comes the 2009 Toyota Corolla XRS in blue. The new Corolla will be available in everything from the standard volume leader to the XRS shown here. The XRS packs the 158 horsepower version of the 2.4 liter engine under the hood with choice of five-speed manual or sequential shift automatic. And even though we prefer our Toyotas older with rear wheel drive, we're sure some enterprising individual will soon figure out how to graft the all-wheel drive Matrix and Corolla sequential transmissions together with a turbo the size of a watermelon in a base Corolla.